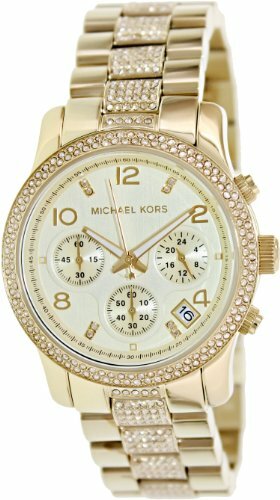 This unique Michael Kors MK5826 analog quartz chronograph watch features a gold dial, 3 subdials, glitz bezel, date display, and a gold stainless steel case and band. Gold-tone stainless steel case and bracelet with pavé crystals on center link band. Three-hand analog display with quartz movement, three sub-dials and date display window.